Every vacation in The Bahamas is a special occasion. With beautiful beaches, exciting activities and excursions, and one-of-a-kind cultural activities and attractions, a Nassau Paradise Island getaway is guaranteed to be unforgettable. But for a truly indulgent vacation in Paradise, why not treat yourself to a bit of extra luxury? Upgrade to a spacious suite or a stay at one of the world’s most elegant resorts, splurge on a five-star dinner (with dessert, of course!) or spend a day being pampered in a top-notch spa—there are countless ways to enjoy a touch of luxe in The Bahamas. One&Only resorts are recognized around the world for their elegance, sophistication and unparalleled luxury. With 35 acres of pristine, manicured grounds and exclusive touches such as the Ocean Pool and exquisite Versailles Gardens, you’ll feel like a celebrity just strolling around the One&Only Ocean Club property, which was once a private estate. For a truly indulgent experience, upgrade to a Garden Cottage, complete with a private courtyard and plunge pool. Escaping to Paradise without the kids? The Cove Atlantis features adults-only, all-suite accommodations, pool and beach club, celebrity chef dining, and much more just steps from a pristine white sand beach. Or treat the whole family to a luxurious getaway—and plenty of space for everyone—with a suite upgrade at Royal Towers. There’s no easier way to upgrade a vacation than by splurging on a decadent meal in a gorgeous setting! In Nassau Paradise Island, gourmet dining options abound, with celebrity chef restaurants and five-star menus to suit culinary tastes of all types. For a special treat, pair a leisurely dinner at Graycliff Restaurant in downtown Nassau with a bottle of fine wine from the expansive wine cellar. This certified five-star restaurant features five dining rooms, including a private dining room in the wine cellar or at the chef’s table in the kitchen. Nothing says “elegance” like the French, and Café Martinique, located in Atlantis Marina Village, is the epitome of French style. Chef Jean-Georges Vongerichten has recreated the luxury and ambiance of the original Café Martinique, which was made famous during its appearance in the classic 1965 James Bond film Thunderball. Today’s Café Martinique offers classic French gourmet fare in a stylish setting—the perfect spot for a special night out. With impressive views of Marina Village, it’s also ideal for romantic dinners a deux. Located at One&Only Ocean Club, Dune by Chef Jean-Georges Vongerichten serves innovative dishes that look as incredible as they taste. Sip on a carefully crafted cocktail on Dune’s outdoor patio overlooking the ocean and enjoy an exciting menu of French-Asian cuisine complemented with herbs from the restaurant’s own organic garden. Guaranteed to make you feel like a million bucks, a spa day in Paradise should be a must for every vacation in The Bahamas. At The Warwick, Amber Spa is an oasis of holistic healing inspired by the powerful properties of amber. Choose from a full spa menu, including facials, body wraps, and massages, or book an in-suite massage for relaxation without even leaving your room. Named “Top Caribbean Spa Resort” by Condé Nast Traveler readers, Red Lane Spa at Sandals Royal Bahamian delivers European-style spa treatments with tropical Caribbean flair. Book a salt scrub on the secluded beach at Sandals Cay, the private offshore island or opt for a massage on a sea raft for a relaxing experience that incorporates the sights and sounds of nature. Prepare to feel your everyday worries and cares melt away as you enjoy the royal treatment! Mandara Spa at Atlantis combines ancient Balinese healing techniques with traditional European therapies and natural Bahamian elements. With 32 treatment rooms, tropical rain showers, plunge pools, and a fitness center, Mandara Spa contains everything you need to feel—and look—glamorous from head to toe. The One&Only Spa offers treatments to suit every mood and lifestyle—scientific skin therapy, detox therapies, and revitalizing treatments combining natural elements with contemporary practice. What’s more decadent than spending a day in a private Balinese-style treatment villa complete with waterfall showers, day beds, and jet tubs? Located at Baha Mar, ESPA Destination Spa consists of more than 30,000 feet of luxurious spa surroundings and the very best in rejuvenating, relaxing spa treatments, from mani-pedis to mudwraps. Unwind in a world of opulence and relaxation at Nassau Paradise Island’s newest resort. Why not take home a luxe souvenir from Nassau Paradise Island—something you’ll treasure for years to come? The Crystal Court Shops, located next to the Atlantis Casino, are home to the highest concentration of designer boutiques in The Bahamas, where you’ll find high-fashion designer labels such as Bulgari, Michael Kors, Tory Burch, Gucci, and Versace. Pick out an heirloom at Cartier or Rolex. For a unique luxury piece, browse shops and galleries such as the Craft Cottage Bahamas, Doongalik Studios, and Bahama Art and Handicraft. Hunt for home décor, jewelry, original art and much more. Don’t let celebrities have all the fun. 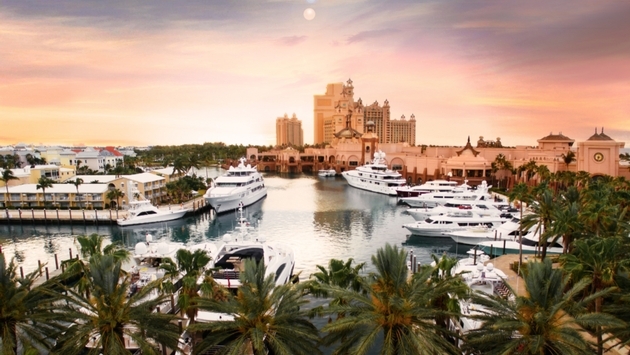 For the ultimate luxurious day on the water, guests of Atlantis can charter a yacht or private fishing boat from the resort’s International Yacht Collection. With more than 40 super-yachts available for charter, you can spend a morning, day or even a whole week sailing our turquoise-blue waters like a star. Advanced bookings are recommended. Don’t forget your phone—you’ll want to Instagram this adventure! With so many premium experiences to enjoy, it’s easy to incorporate a little luxury into your Bahamas vacation. Check out our current travel deals, and use the money you’ll save to splurge on an unforgettable experience or two! After all, you’ve earned it. Make the most of your time in Paradise. The memories will last a lifetime. Amy has been blogging about Nassau Paradise Island since 2014 and counts it among her favorite destinations in the world. When she’s not enjoying the beaches of The Bahamas, she works with VERB Interactive, a digital marketing agency based in Halifax, NS, Canada, where she develops and executes online content strategies for international clients in the luxury travel and tourism industry.